I hope everyone is doing awesome today. I finally sat down to post my latest creation today. 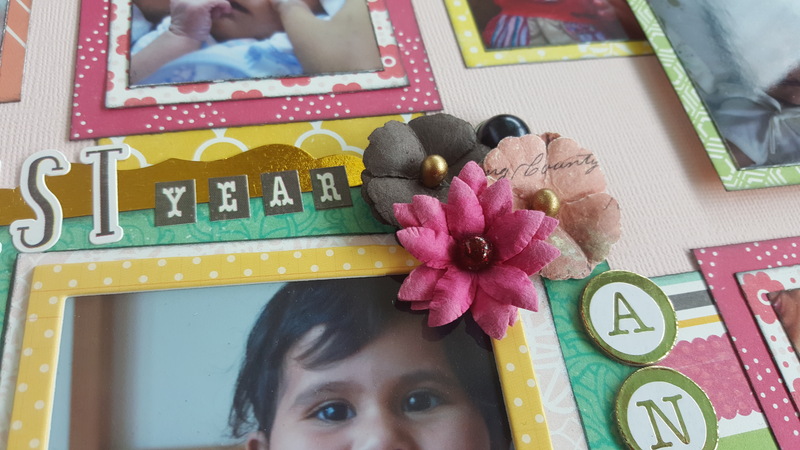 I know I was MIA in action for the past several months due to various reasons and wasn’t scrapbooking much. But, now that I have got everything setup and life is beginning to settle down after the second baby I promise to create and post more often. 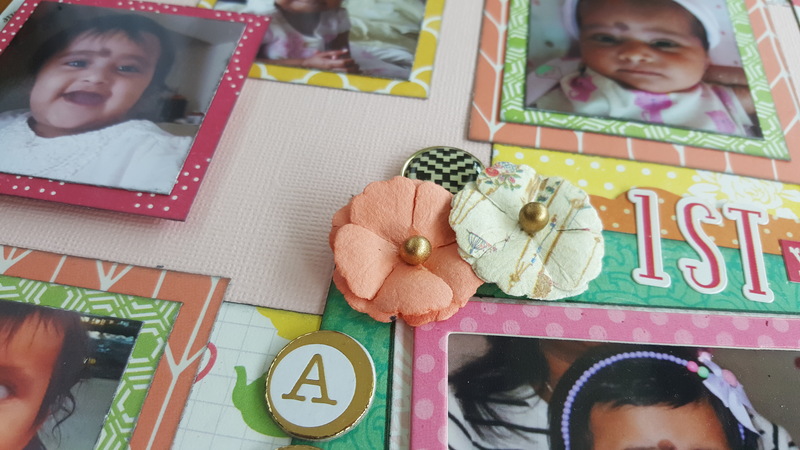 Today, I am sharing two scrapbook layouts which are 12″X12″, which I intend to frame and hang in my children’s room. These pages are my take on the “Baby’s First Year” albums which we generally see in the market, I decided to create my own custom album. I loved creating these! I used the paper collection “Petticoats & Pinstripes” by Echo Park. 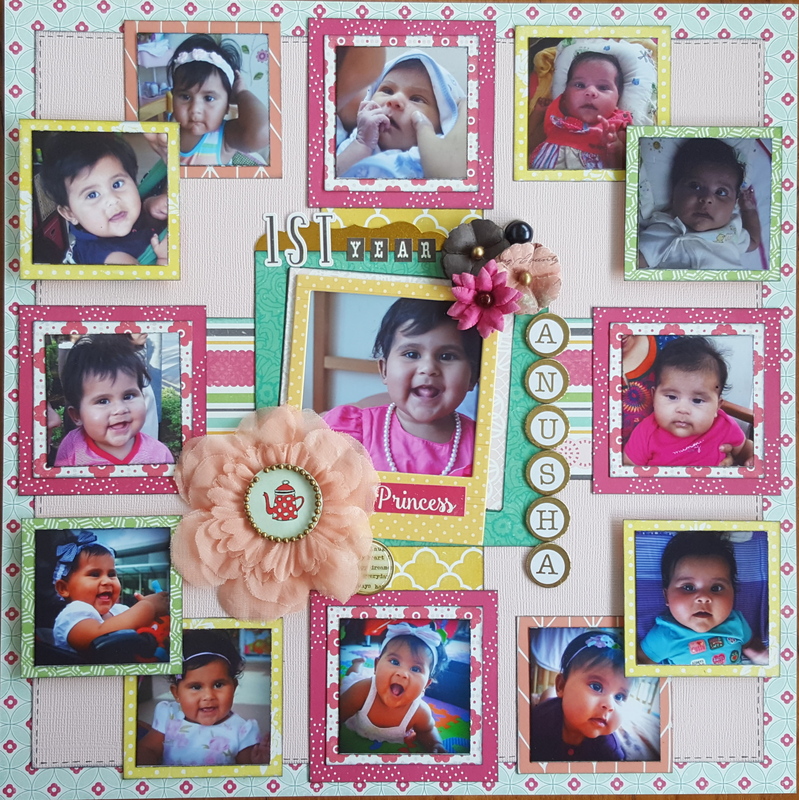 This is actually a very simple layout, double matting of key month photos, added some prima flowers and embellishments. 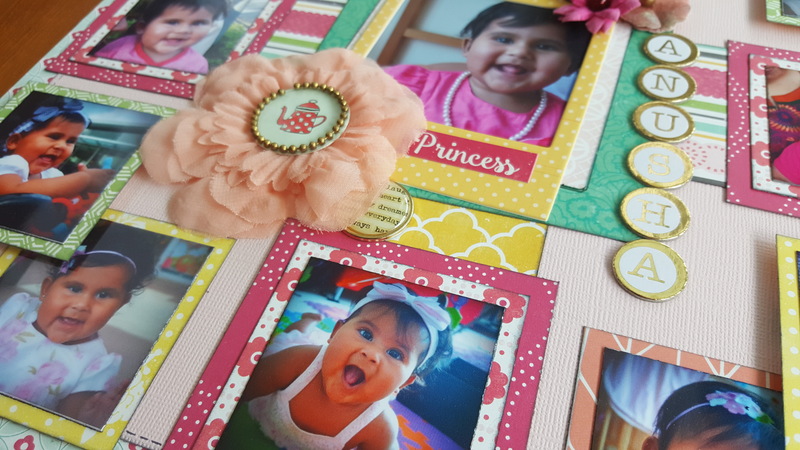 The small photographs are 2″X2″ and the center photograph is 3″X3″. 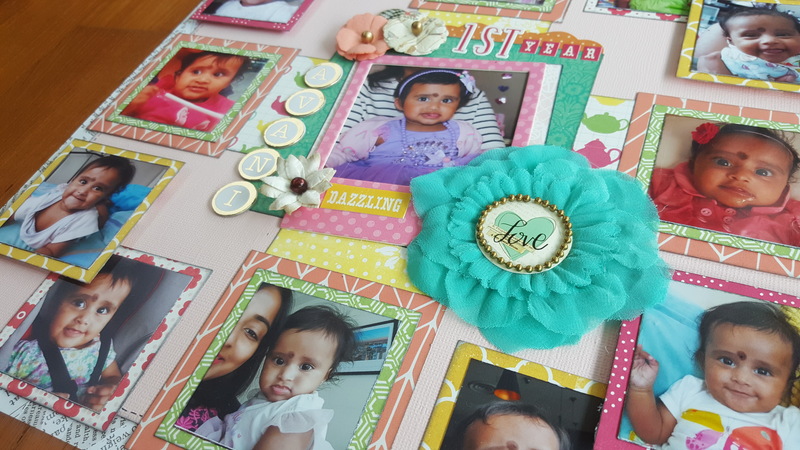 I have also added a photo frame around the center photograph which I think looks very cute. I don’t have them framed yet, since I just finished making them and haven’t found the 12″X12″ frame yet. But, I promise I will update this blog with the pictures on the wall so that you can get an idea. 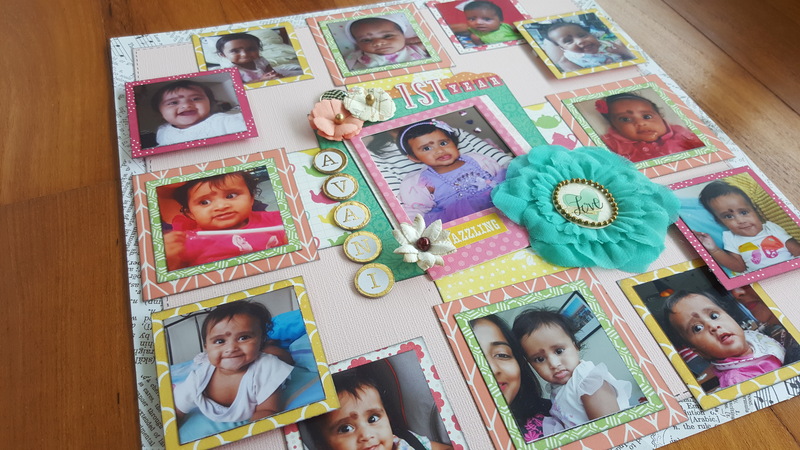 This is the first layout for my older daughter’s first year. The gold and white chipboard letters add the perfect touch. Bunched up some prima flowers in the corner. I have also used a brad for added dimension. This is the layout for my second born. She just turned 1. I have kept both the layouts pretty similar so that they complement each other on the wall. 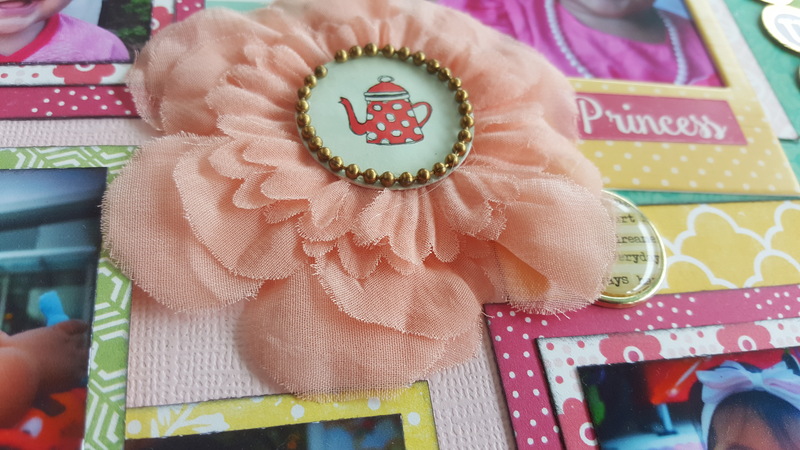 Used similar prima flowers, brads, embellishments, accents, frame and chipboard letters in this one as well. The patterned papers used are also from the same collection but I have used them in different areas to get a different but complimentary look. I hope you liked this layout and got some ideas. Beautiful way to preserve memories…..Came here from infinitereflections….